For my sort of use, better than the more complex and expensive Voyager. Around SW USA for a few weeks on a Honda CRF250-L.
Now $130 but still a bargain compared to the Voyager at twice the price. Trail Tech supplied me with the Vapor in return for advertising in AMH6. 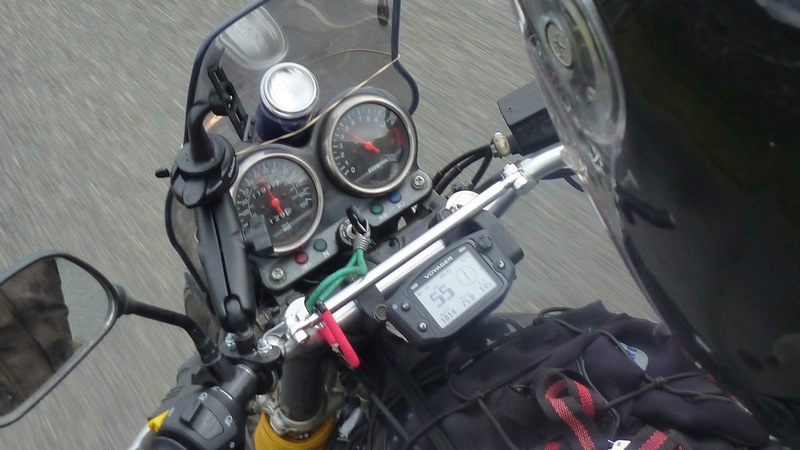 Trail Tech market themselves as selling ‘Aftermarket off-road powersport products’ including digital gauges for enduro bikes and quads which may have no instrumentation at all. 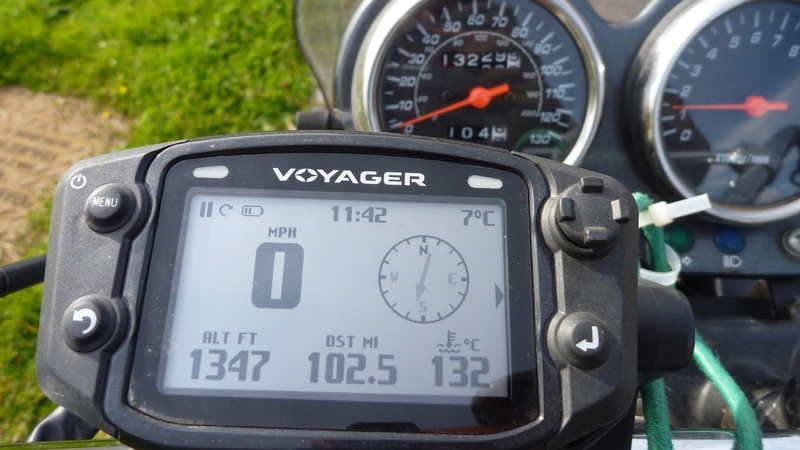 They don’t claim to produce units suited to motorcycle overlanding, but many of the features their digital gauges display are handy on the long road and will be a useful back up if your GPS/satnav packs up. The Vapor users’ manual is here. Using the three buttons it also has a customisable User Screen to display various sets of data plus a back light for night-time use when wired to the 12-v bike battery. The Vapor will also run off a CR2 watch battery for a while. I used the Voyager (see below) before I tried the Vapor but this unit is much more suited to my sort of riding which may involve a proper GPS or satnav for navigation. The Vapor provided data for things which the basic Honda didn’t cover, including RPM, though this did fluctuate a bit like an old Triumph rev gauge and to me was comparatively not that useful. Fitting it to the bars was easy, if not so secure against theft or vandalism. They do offer a more metal cowling to make it less nick able but I’d much prefer to remove the pocket-sized unit in dodgy areas. A couple of wires go to the battery but the fact that the unit is always live (or ‘sleeping’) and the display stays on for a 15 minutes after coming to rest can attract unwanted attention. Making your own q/d mount with a grouped connector plug would be worthwhile on a long trip; out of sight is out of mind. As it was, in outback Southwest US I was never worried about it getting pinched or messed about with. Other attachments to enable the unit include easily wrapping a wire around the HT lead to provide a pulse for the RPM read out. They advise that modifying the number of HT coils can minimise the fluctuation of the RPM read-out which varied over 2000rpm at times. Nut I never bothered trying to get it smoothed out as RPM proved not so important to me. There are two was of getting a speed and distance reading; off the in-built GPS signal or off the wheel. You may be surprised to learn that the old-fashioned geometric method off the wheel is more accurate. Replace one of your disc rotor bolts with a magnetic item supplied in the kit, then zip tie a pick up (sensor) cable to the fork leg. Now accurately measure the diameter of your tyre, program it in as the instructions explain (all easy) and you have an accurate distance and speed measurement that can be modified as the tyre wears or gets changed. 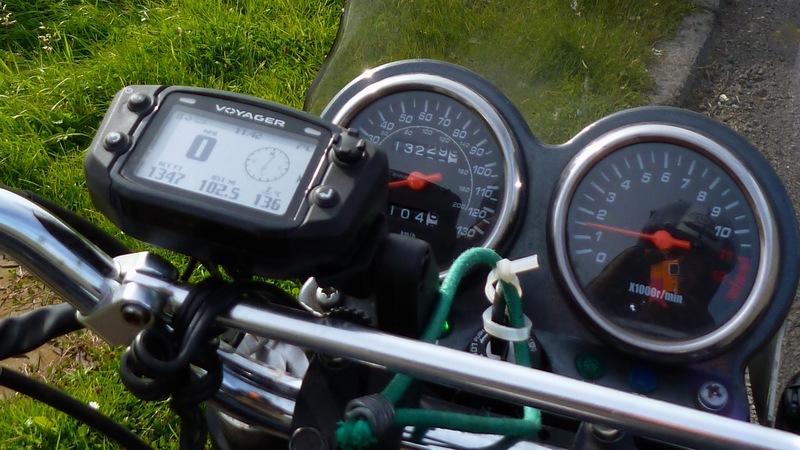 As you may have read in my CRF-L review the Vapor revealed how widely inaccurate the Honda’s speedo – and therefore odometer – were. Click on the photo right and you’ll see how the true speed on the Vapor is 10% faster than on the Honda, and the more important odometer is even more out. Relying on the Honda’s readings, this would have given falsely pessimistic fuel consumption readings and therefore an inaccurate fuel range when compared to roadside distance markers. In truth you actually travel 10% further than the Honda shows. My CRF-L fuel records were all taken from the Vapor backed up by the GPS. The Honda uses an electronic speedo sensor somewhere in the gearbox so once you mess about with gearing and tyre sizes, it goes off. My gearing and tyres were all normal; raısıng the gearing by 10% may bring the Honda speedo reading back in line, or there’s an inline electronic gadget called a SpeedoDRD you can fit to recalibrate the OE speedo, but it looks pretty fiddly. Engine and ambient temperatures were another very useful feature. 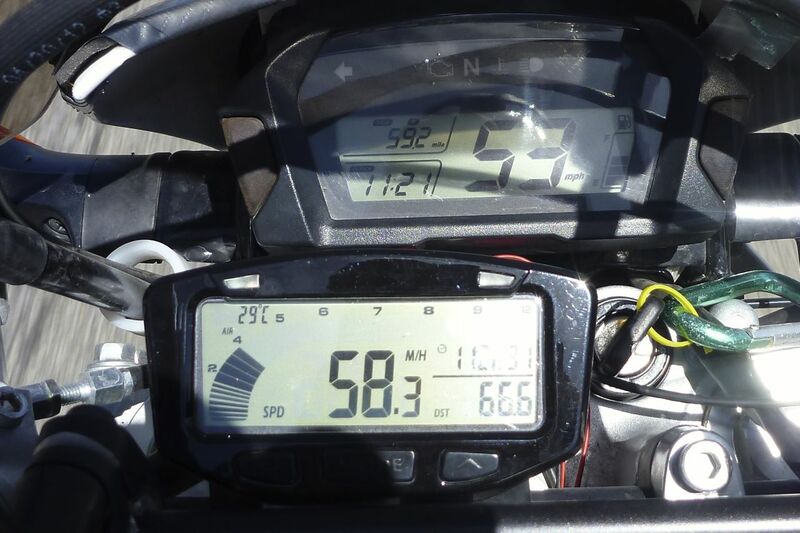 I’m staggered that some bikes have no overheating warning and know of at least one KTM engine that blew in the desert for not having a water temp warning. On the Honda it required cutting an inch out of a rad hose to install the sensor. The ambient air temp sensor is somewhere on the body of the unit. I suppose it may get hot and over-read if parked in the sun for a while. On a little 250 engine plugging up a rough incline with a tail wind, I found it very useful to keep track of the engine water temp. Both air and engine water readings may not have been absolutely accurate but I assume they were consistent. As my water temp reached 100°C and the fan came on I could choose to pull over and turn the bike into the breeze with the engine running. It’s possible to set one of the Vapor’s warning lights to come on at the water temp reaches a certain level, but they’re quite small. I found it easier to watch the temp figures climbing and react appropriately. 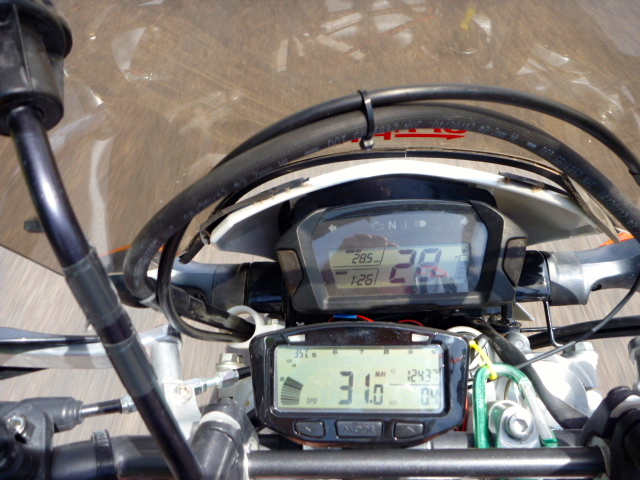 The temp read-outs were something I’d like to be bigger on the screen as often I’d ride ‘on the temperature’ (s well as the terrain), rather than on the speedo. The other read-outs like time, elevation and compass overlapped with the GPS/satnav but were handy back-ups. Overall I found the Vapor indispensable on my ride, even though I used a satnav and a GPS, both of which proved essential route finding aids out in the hills. The accurate speed/distance enabled me to accurately calculate the potential fuel range and the temperature read outs stopped me running the engine too hot for too long and reminded me that I need a drink too. At the other extreme they say the unit may not operate or display properly below freezing. I included a lot of stuff when I sold the CRF but I kept the Barkbusters and the Trail Tech Vapor for my next bike. A nifty and versatile trip computer with basic GPS capability. Riding around Britain on a GS500R for a few months. 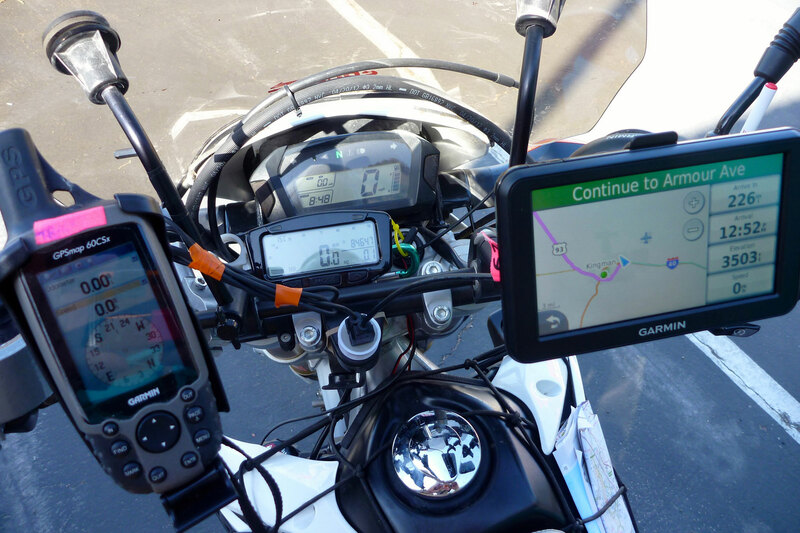 The Voyager is the sort of computer that’s now commonly integrated on CANBus bikes such as the BMW F650GS I rode in March. That one was linked to the engine and so could accurately give fuel tank and even mpg values. The Voyager has a small 400 x 240 mono LCD screen an on/menu button, a 4-way toggle button, an ‘enter’ button and a next page button. The screen displays the following: GPS speed/distance, Wheel speed/distance (more accurate), GPS compass, GPS altitude, Air and engine temperature, Time, non-routable GPS maps. It also has a customisable User Screen giving a pick up to six sets if data to display and a back light for night time. To me they include: time; ambient and engine temps; a very accurate wheel-based odometer and a compass. There are six screens you can toggle across: Main (pictured), Map, Air/Engine Temperature graph, Altitude record, the customisable User Screen, Nav Screen and a Satellite status Screen, as on a GPS. I took a long ride up to Scotland in June with the Voyager (until it went flat after a couple of hours due to a loose bike battery connection), and a ride back a few months later, including three hours of pelting rain. On both occasions, using the main screen, I found the Voyager a very useful gadget. On my air-cooled GS it was good to have an engine temperature (spark plug) reference point, same with air temperature, especially when combined with the altitude. The clock is also handy of course and I found the compass very useful when trying to unravel cross-country short cuts while riding without the aid of a paper map or satnav. I did try at one point to load an OSM map via the mini-SD card but didn’t have any luck and having spent hours before with GPSs I didn’t persevere too much. 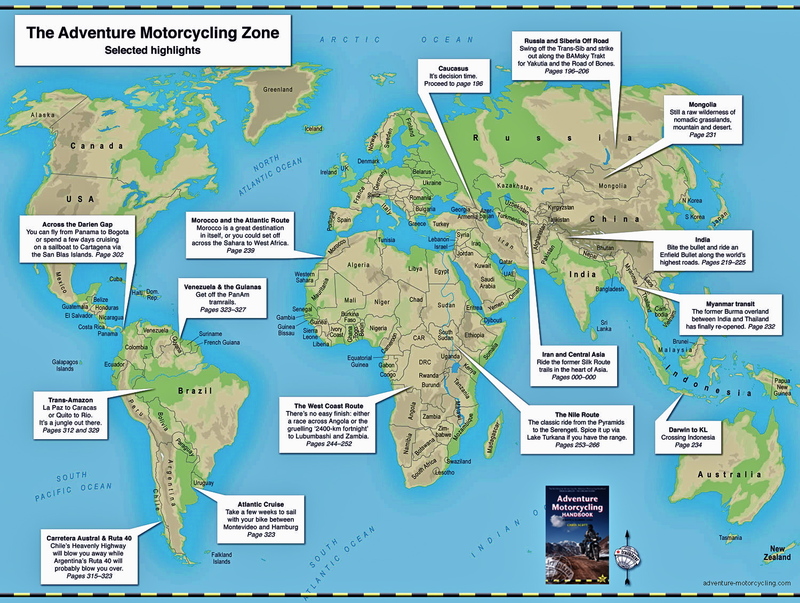 A Voyager’s memory is limited: you’re not going to be able to load an OSM country map – the unit is designed to carry mapping for relatively short-range day rides; it won’t replace a proper satnav. The main flaw is that it can’t be removed quickly, as you would any aftermarket satnav or GPS. 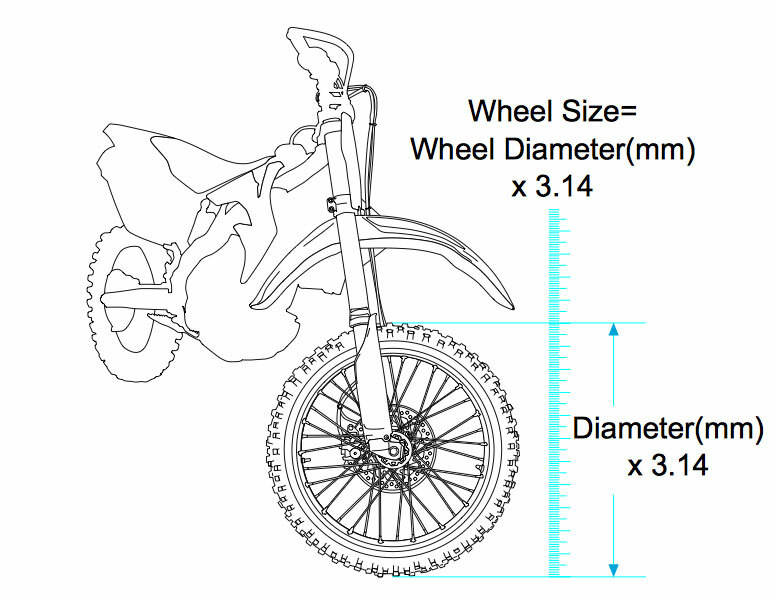 It’s intended for mounting to your quad you wheel off your pickup. Leave it on around town and someone will try to nick it for sure (with tools they’ll succeed). You could adapt it with a quick plug for the three or more wires and use some sort of butterfly nut to fit it to the handlebar clamp. 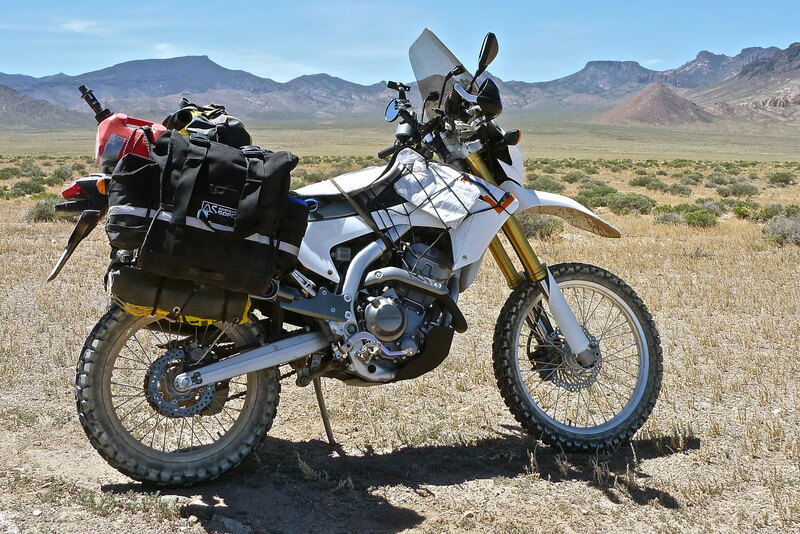 This entry was posted in Adventure Motorcycling Gear Reviews, AMH News, BMW F650GS SE long term test, Project Bikes, Project: Honda CRF250L, Suzuki GS500R Overlander and tagged Trail Tech Vapor, Trail Tech Voyager. Bookmark the permalink.